Postlewait's ~ True Country Elegance at it's Best! True Country Elegance at it’s Best! Come fall in love once again at Postlewait's Country Weddings. As a family we are determined to make your special day one that will be remembered as perfect! We are located in the heart of the Willamette Valley, centered between Portland and Salem near historic Aurora. Postlewait's is situated on a working farm and offers rustic country warmth amidst beautiful park-like grounds. Majestic trees, lush lawns, water features and a rippling creek are surrounded by authentic rural sights, providing the perfect backdrop for your memorable event. True country elegance at its best! Amongst a working farm of 80 acres containing orchards and vineyards lays a beautifully landscaped park. The natural beauty of the Cascade Mountains while under old growth oak trees will make a perfect setting for a memorable event. Outdoor options under a canopy of oak trees or in front of a rustic arbor and indoor options incase of poor weather. The Saloon is a great bar location with working tap system and also makes for a great photo! Expansive grass area with a large dance floor in the center, surrounded by Hazelnut Trees, Vineyard and stunning views of Mt. Hood and the Oregon Cascades. At night this site makes for beautiful private dances with your new spouse. The rustically elegant indoor venue has room for up to 200. Connecting the indoor reception building to the ceremony sites and outdoor reception area, it also makes a great photo opportunity. Rates are for one day 11:30am-11:30pm. A one and a half hour wedding rehearsal is included in the rental and generally scheduled on a Thursday due to Friday weddings. Rehearsal dinners are not included in the venue rental but please contact the winery for details on the Tasting Room. Pricing is for 200 persons maximum, additional fees will apply for larger events. **** Additional Services are available such as rental items. BOOKING: This is both our family business and home so we try to keep showings by appointment only. Please feel free to call or email us for an appointment or for a list of available dates. If you would like to book a date, make sure to give us a call so we can be sure to reserve your event in our books. Thanks! Please fill out fields below to schedule a showing. Shown by appointment only. Please allow 1-2 business days for response. Contact our list of vendors for exclusive wedding packages available only to Postlewait's Brides! For venue inquiries and questions please see our Contact Page. Free wine glass rental with 2 cases. Experience of nearly 100 weddings at Postlewait’s! Postlewait’s may be a stunning wedding venue but we’re also a working farm. The venue is surrounded by picaresque hazelnut orchards, a herd of red and white faced Hereford beef cattle and the wine grapes of Postlewait’s Vineyards. The herd goes back many cow generations all raised and grass fed by farm owners Gary and Carolyn Postlewait. A true cow calf operation we welcome new baby calves every spring, who can often be seen running through the pasture during events. 35 of the 80 acre farm is planted to hazelnuts. Also known as Filberts, the many tons of nuts grown on the farm end up in domestic candies and are sold all over the world! 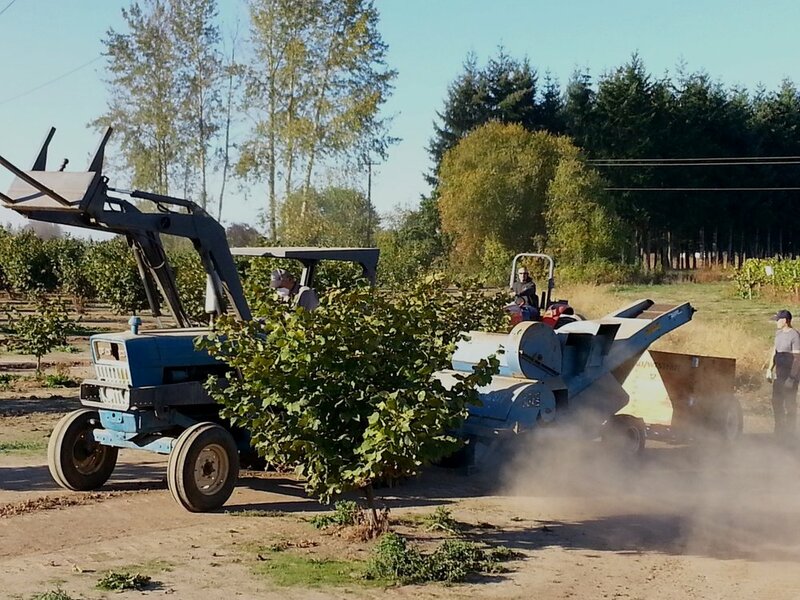 Oregon is one of the premiere places on the planet for Hazelnut growth and it has become a passion for the Postlewait Family. Postlewait’s Vineyards is actually a bi-product of the Wedding Venue. The family was forced to plant 15 acres of wine grapes to comply with land use laws and legally have weddings & events. The Vineyards have evolved into Whiskey Hill Winery & Postlewait’s Vineyards. Now you can taste the fruits of our labor in the wine Tasting Room. Shown by appointment only. Please allow 1 - 2 business days for a response.